Telling others to, “Have a Great Day” can have a counter-intuitive effect. It can make you feel as wonderful as the receiver of the message. So many of the challenges in life can be met head-on by showing up, and approaching things with the right attitude. Doing difficult things with a smile on your face makes a difference. The positive insights below will put you in the right frame of mind. Read through them all, jot down your favorites, and use them for daily motivation. Good news equals good days. Even the worst days have an ending, and the best days have a beginning. my heart is dancing with joy. and my soul is longing for your soul. I have learned over the years that the nicest thing I can do is to just say to myself, Good Morning Darling, I love you; we’re going to have a really great day today. Every day is a good day. There is something to learn, care and celebrate. A lesson learnt, is a deed well done. Make sure you learn something new every day. As stupid and vicious as men are, this is a lovely day. A bad day for our ego is a great day for your soul. A little spark of kindness can put a colossal burst of sunshine into someone’s day! May you be blessed with lots of compassion and opportunities as you start your new day. Have a nice day dear. Your happiness is my happiness! Start your day by convincing yourself that today is going to be a wonderful day no matter what the odds are. 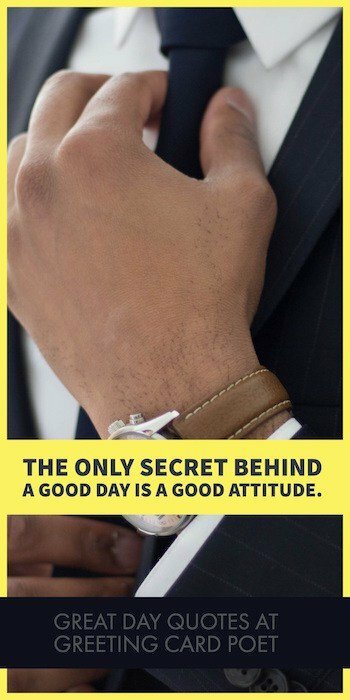 The only secret behind a good day is a good attitude. And welcome this new day today. 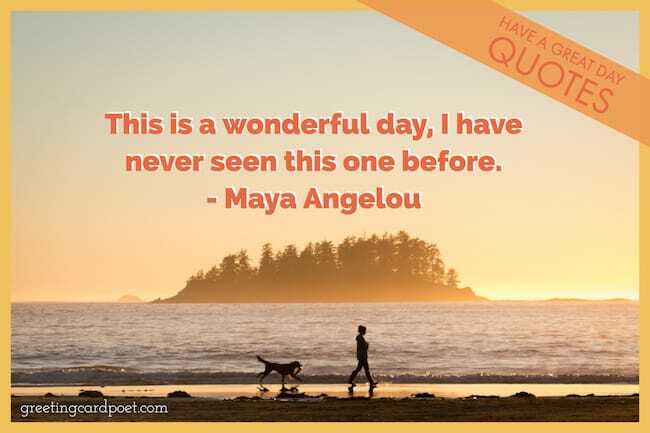 This is a wonderful day waiting for you to enjoy. Wishing you a day full of sunshine. I just wanted to say I hope you have a wonderful day. May your worries be light and your joy be great. Good morning…have an awesome day! Spread sunshine all over the place and put on a happy face. Life is beautiful; enjoy the ride. Good morning sunshine – it’s coffee time. Unwrap the gift of life with gratitude. Tip: Use these quotes in email messages to your team to brighten their mornings and start things on a positive note. A broken wing simply means, you have to find another way to fly. Have a wonderful day people. 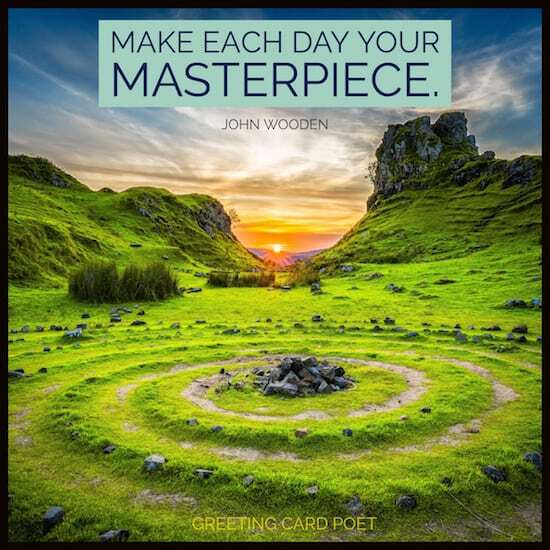 To create a wonderful day sometimes takes just a slight change in the way you look at it. Be willing to let go of an old, negative way that you look at something, and look at it in a new, positive way. I think a day in your life on which nothing bad happens may be a wonderful day, but it probably isn’t going to be the basis of a story. Todo mi amor y suerte por tener un gran día hoy. No te preocupes por cómo fue ayer. No te preocupes por cómo será el mañana. Concéntrese en lo que está haciendo hoy para hacer un gran día. Cada nuevo día está destinado a grandes cosas, y espero que solo te pasen grandes cosas hoy. Sending you lots of smiles your way, because I want to see you smiling every day. Drink a glass of water to rehydrate as soon as you wake up. Find time to go on a walk and smile at every person you encounter. Stretch your muscles – take it slow at first. Stretch your mind by trying something new, doing something creative, or working on something fun besides work. Do something special for the one(s) you love. Make dinner, buy flowers, or complete that small project that no one likes to do. Listen to your favorite song, and dance to it if you get the urge. Spread compliments around like confetti. What are you saving them for? Be thankful for all that you have – there are many less fortunate. 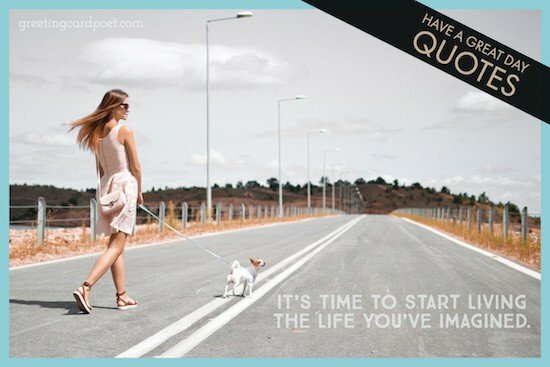 You’re on Have a Great Day Quotes page.